In this photo the Station looks a far more imposing building than it does today doesn't it. It seems my comment got erased somewhere along the line. If you find it, post it. 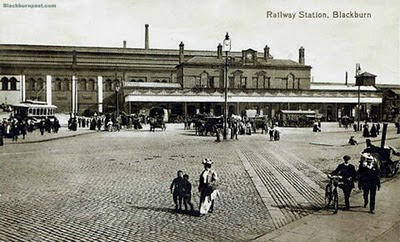 I remember eating roast spuds at the bus station waiting for the bus to take us along Preston New Road to the Windmill. Uncle Bill lived in No1 Windmill Cottages, Samlesbury with Auntie Bet who was cook at the Blackburn Co-op Restaurant for years during and after the war. Eventually my Mum and Dad returned to Windmill and occupied No 2, before moving up toe St. Marys Gardens to the warden Controlled Seniors housing. Hi Neville - The comments have to be approved / moderated (in case there is something offensive etc) before they go live. It doesn't happen automatically, they all have to be read first. I'm not at the computer constantly, so sometimes they take a while to hit the screen. I normally 'moderate' at least once per day, sometimes more. Thanks for your comment, I hope you're enjoying the blog / site. I understand the way things work and i will do everything withing my power to obey the rules. I have been living in Canada since 1964. I spent some time at Windmill in 1973 and at Mellor 1991. My mother told me all kinds of things Woodfold Hall where she was one of the gardners. She won prizes aat the Blackburn Horticultural Society show being classed as the young whippersnapper from Woodfold as she was only 17 at the time. There's no rules as such Neville. Just the need for moderation. Must have been a nice place to work Woodfold. There's a few pics of it on the site. Look under 'Pubs & Breweries' - I put it under that 'label' because of the Thwaites connection.